Mr. Thompson provides music classes to all students in grades Kindergarten through Fifth. Students in Fourth Grade play recorders. 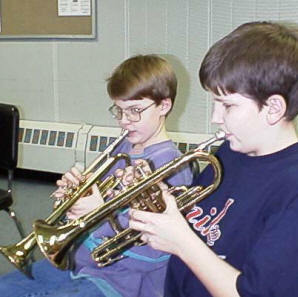 In Fifth Grade they begin learning instruments and have band twice weekly. By Sixth Grade those students choosing band meet daily. To the left you see fifth graders Brandon and Ricky practicing.